A potential payout to Stadler is expected to be considerable since he got a new contract from Audi in May. 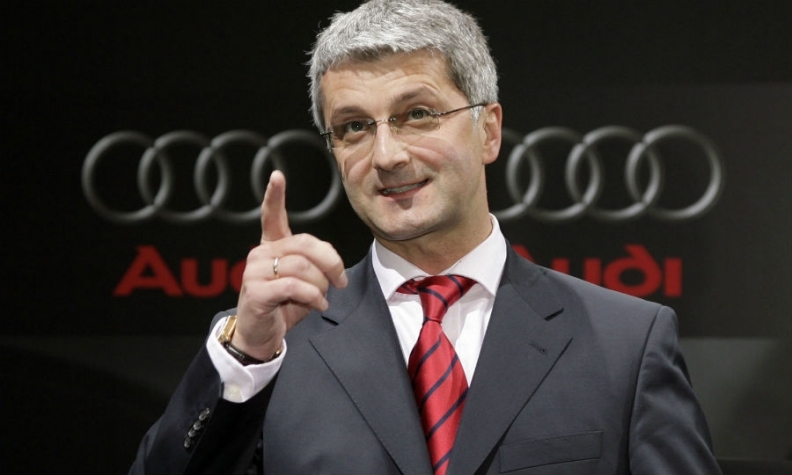 FRANKFURT -- Audi’s Rupert Stadler stands to receive a golden parachute, earning millions if he agrees to step down as chief executive with years still left on his contract. The supervisory boards of Audi and its parent, Volkswagen Group, are expected to try to reach a deal with Stadler on Tuesday over an early termination of his contracts with both companies. Sources close to the talks said Stadler is expected to walk away with a severance package as part of the deal. Stadler, 55, remains in jail after he was taken into custody in June by Munich prosecutors who suspected him of interfering with their criminal probe into the automaker's diesel-emissions cheating. VW Group's board postponed a decision on Stadler's future on Friday. Sales executive Bram Schot remains Stadler's interim replacement as Audi CEO. Both VW and Audi have said that Stadler is presumed innocent unless proved otherwise but he is unlikely to return to his post even if he clears his name because he is now seen as damaged goods. Neither VW Group nor Audi can simply fire Stadler as long as the allegations are not proved, since he would likely have legal recourse to sue the company for wrongful dismissal. This means the most elegant solution available is to negotiate a deal with Stadler, who remains indefinitely detained at a jail in Augsburg, southern Germany. Sources say the current situation of a CEO behind bars is not tenable for the premium automaker and that every day Stadler retains his office is one more day that Audi’s reputation is tarnished further. A potential payout to Stadler is expected to be considerable since Stadler got a new contract in May. Audi’s supervisory board unanimously voted at the time to extend his contract through the end of 2022 despite red flags. Two months earlier prosecutors conducted a high-profile raid of the company's headquarters in Ingolstadt, Germany, hours before Stadler presented the automaker's annual results. Assuming his fixed and variable financial components would not fluctuate materially over the remainder of his term, Stadler would stand to earn 15 million euros in the course of his existing contract with Audi. VW Group declined to disclose the length of its contract with Stadler as a member of the executive board. Its annual report states, however, that he received additional compensation totaling 5.25 million euros for 2017, including benefits such as payments into his pension plan. VW has made headlines in the past with its generous golden parachutes. It paid Christine Hohmann-Dennhardt more than 6.9 million euros to terminate her contract as the group’s executive board member in charge of Integrity and Legal Affairs in January of last year. This was considered an exorbitant amount for just 13 months of work, in particular since the group paid her another 6.3 million euros on top to compensate her for prematurely buying her out of her contract with previous employer Daimler.